Amber wakes up in a hospital. She can’t move. She can’t speak. She can’t open her eyes. She can hear everyone around her, but they have no idea. Amber doesn’t remember what happened, but she has a suspicion her husband had something to do with it. 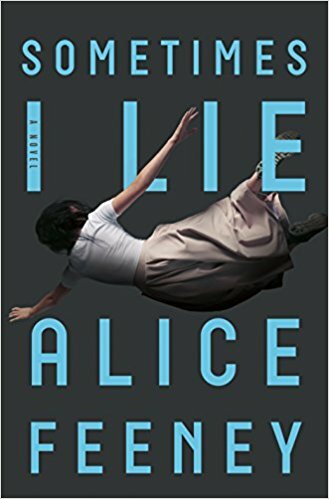 Alternating between her paralyzed present, the week before her accident, and a series of childhood diaries from twenty years ago, this brilliant psychological thriller asks: Is something really a lie if you believe it’s the truth? A woman in a coma tries to make sense of what happened to her, as she lies trapped within herself, sure her husband had something to do with it. But then again, she tells us right off, sometimes, she lies. Alice Feeney’s debut—SOMETIMES I LIE—is an ambitious, gripping psychological thriller with so many twists it will leave you reeling. The narrative is thoughtfully plotted with diaphanous threads that thicken and entwine as the novel progresses. Told in both the present and past tense, the story culminates in Amber (the woman in the coma) recalling exactly what happened and the truth is far more complicated than expected. And the end—whoa. It’s Boxing Day and Amber realizes she’s in coma, but she can’t move, can’t speak, drifting in and out of consciousness. Clues to what happened come from nurses and doctors, from her husband and sister, from an angry ex, and from fragmented memories she tries to coalesce. And so the journey starts, as we alternate between what is happening now, and through entries in a diary, what happened in the past—events that shaped the lives of many. The fascinating thing is that even as we glean certain truths along the way, those same truths twist and turn into falsities. Nothing is certain, nothing is reliable in this tightly knotted, ever-shifting drama. While some of these gradual-setup kind of stories may lag, this one didn’t because the journey itself, how it all unfolded, is insane and gripping itself. Super chilling too at times… I think I audibly gasped as surprises hit us hard and fast in the end. Fans of unreliable narrator stories—the good ones—will love this book like I did. Wickedly clever, surprising and addictive. Strap yourself in, and get ready for one heck of a ride.